From the classic 1979 science-fiction movie, Alien, comes this amazing Random Vinyl Mini-Figure from Alien Titans: The Nostromo Collection! This Random Vinyl Figure is part of a 12 piece set. 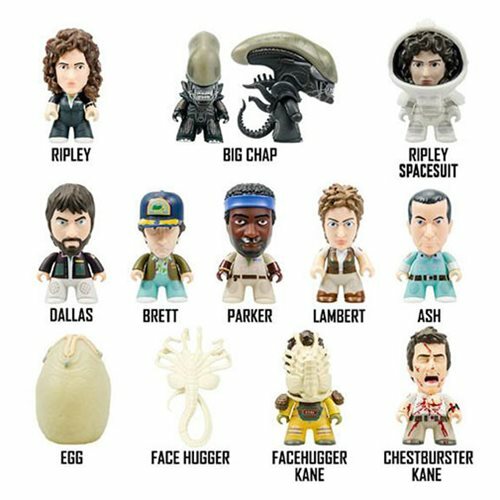 The entire crew of the USCSS Nostromo are featured in this 12 piece set - including their stowaway, the infamous Xenomorph (nicknamed ‘Big Chap'). From the secretive Science Officer Ash, to the ill-fated Kane, to the heroic Warrant Officer Ellen Ripley, every member of the doomed star-freighter is featured in 3-inch blind-boxed format. Also featured - in every stage of its evolutionary cycle - is the eponymous creature: Egg, Facehugger, Chestburster and adult Alien are all represented in vinyl form!